IDatalink's ADS-KIT-MUS01 kit includes a dash console that matches the fit and finish of your factory dash. This kit also includes two integrated USB ports that work with your compatible receivers. Compatibility Notes: The iDatalink ADS-KIT-MUS01 kit must be used with the iDatalink Maestro RR adapter and a compatible Kenwood or Alpine receiver (See Details for receiver compatibility). Mustang 2010-2014. ISO DIN radio provision with pocket. ISO DDIN radio provision. Antenna Adapter. Axxess interface and wiring harness included. Wiring and Antenna Connections. Micro BUSB updatable. Retains balance and fade. Front panel with dual-color touchscreen provides 1A look as ex factory. WE HAVE TECHNICIANS WITH OVER 20 YEARS OF EXPERIENCE IN CAR AUDIO/VIDEO/ALARMS/INTERFACING/KITS. High-quality scratch-resistant ABS / PC plastic construction. 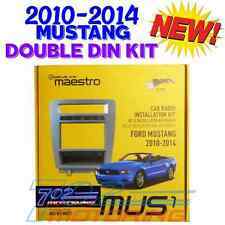 NIB iDATALINK ADS-MUS1 KIT-MUS1 RADIO INSTAL KIT + ADS-MRR 2010-14 FORD MUSTANG! IDatalink's KIT-MUS1 integration adapter includes a dash console that matches the fit and finish of your Mustang's dash. This kit also includes two integrated USB ports that work with your receiver. ISO DDIN radio provision. Not required. Antenna Adapter. Toyota 4 Runner. Toyota Celica 2000-2005. Toyota Corolla 2009-up. Toyota Echo 2000-2005. Toyota FJ 2007-up. Toyota Highlander 2001-2007. Toyota Highlander 2013. Toyota Matrix 2003-2008. S60 05-09 / V70 05-07 SDIN/DDIN. Volvo V70 2005-2007. Volvo S60 2005-2009. ISO DIN radio provision with pocket. DoubleDIN radio provision. Painted custom color to match factory. Includes a storage pocket below the radio for single DIN Applications. Install dash kit for Single or Double DIN/ISO Radios. Designed and manufactured with precision tolerances, resulting in a gapless fit between the dash and the kit. Cougar 99-02. Mustang 01-03. Single Din Radio ProvisionWiring and Antenna Connections. Double DIN Radio Dash Kit With Wire Harness. Includes wire harness that plugs into car wiring - just match colors to your radio wiring,connect and plug it in. For 2005-2006 Ford Mustang Vehicles. Kit is custom designed for a perfect look and fit on these vehicles. 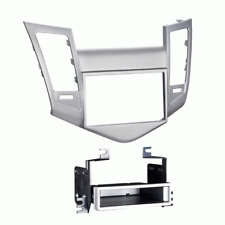 Ford Expedition 2003-2005 Lincoln Aviator 2003-2005 Lincoln Navigator 2003-2006 Mercury Mountaineer 2002-2005 Provides pocket with recessed mounting of a DIN radio or ISO DIN radio Rear support brackets are included . Fuse Holders. - Factory Radio. For 2010-Up Ford Fiesta vehicles. For select 2011-up Ford Fiesta models. - Signal Processors. - Dash Kits. - Installation Harness. - Neon Lighting.